I stitched on 3 of my gifted projects this month! 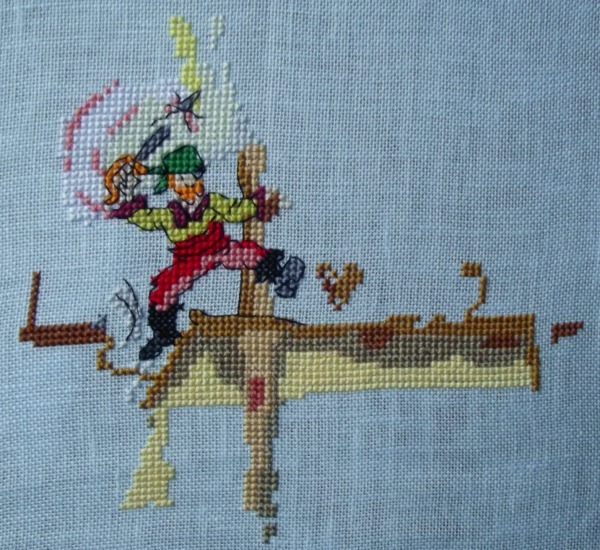 I added the back stitching to the little pirate on the Cut Thru' Pirate Ship, and stitched more of the ship (shown above). 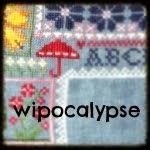 It's hard to see the progress, but I worked on several areas of this sampler. It has a ton of back stitching in several colors! 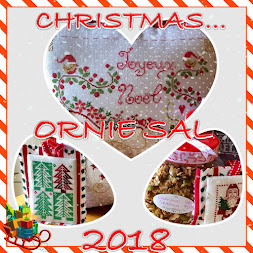 And finally ... I put in some stitching time on the Linen & Threads 2019 Mystery Sampler. This is a free year-long SAL (stitch along) with a section of the chart provided each month by Linen and Threads. I am stitching with plain DMC black on 28 count Monaco that I tie dyed with a Tulip Tie-Dye kit. 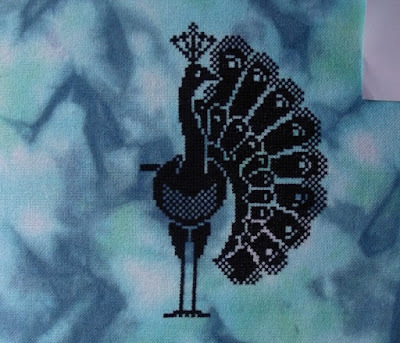 I am right on schedule with my peacock and should have him finished before the end of the month. It is not too late to join in on the fun, you can grab the chart and details here: http://linenandthreads.com/mystery-sampler-stitch-a-long, and there is a facebook group where several folks are posting photos of their projects. It is fun to see all of the different color, thread, and fabric choices people have made. Many are adding beads to their peacocks. Great work, spring is looking great. 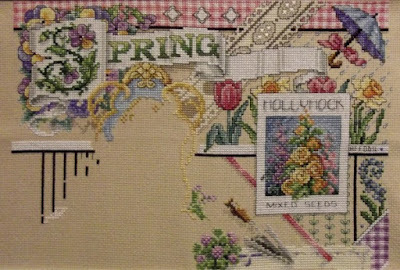 Love the look of your spring sampler. 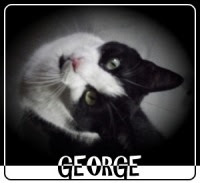 Thanks for taking part in GG this month. 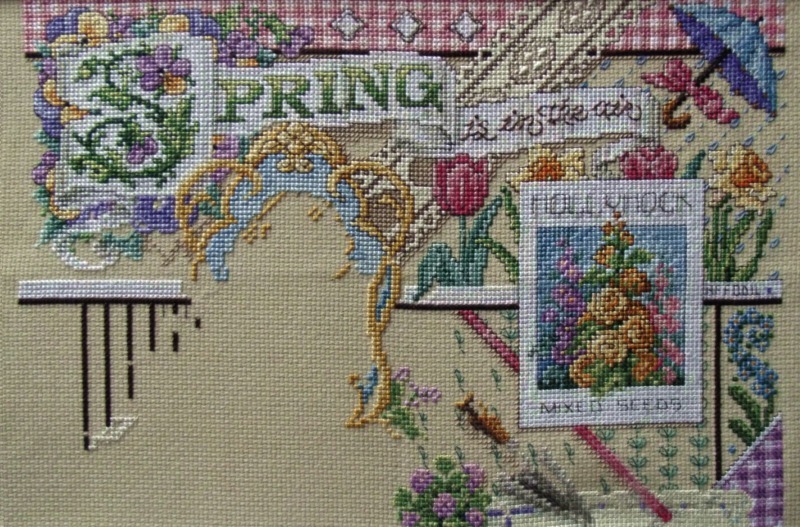 Lovely progress on your Spring Sampler. There's a lot of detail in there. Love that peacock, I have downloaded that part already, it's a nice stand alone even without the rest of the design! Nice! 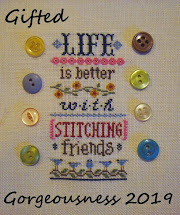 I have decided not to join the 2019 SAL although I am planning on stitching the 2017 one. Better late than never. Such pretty projects! It's nice to visit and watch the progress. I always admire (and somewhat envy) those people who are stitching multiple projects simultaneously. I can't do it! 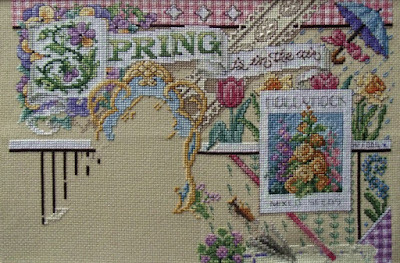 Oh the spring sampler is gorgeous!So much detail!AriadnefromGreece! 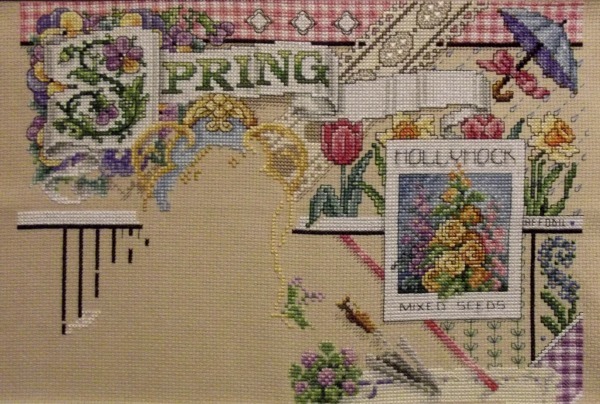 Great progress, your Spring Sampler is so pretty! I've seen that SAL and I'm so tempted, now I have to take a look. Um, thanks? !